The “global savings glut” thesis was coined by Ben Bernanke in 2005, and refers to the notion that downward pressure on US interest rates was predominantly caused by excess savings in foreign trading partners such as China. One way to view this debate is that it is commonly believed that a countries current account is driving the capital account (i.e. that the latter is the source of financing for the former). Bernanke essentially pointed out the possibility that the causal arrow is stronger in the opposite direction – that strong demand for US assets (i.e. a capital account surplus) was driving the current account deficit. In their case for the global savings glut thesis, Henderson and Hummel (2008) acknowledge that US interest rates were below their natural rate, but claim that Greenspan’s policy was “tight”. Selgin (2008) responded by downplaying measures of the money supply in favour of the interaction of the money supply and the demand for money. His argument is that if the PY side of the equation of exchange is volatile than so must MV by definition. Interestingly, The Economist considered this in 2005, using basic IS-LM analysis to demonstrate that an increase in global savings would be revealed as a downward shift in the IS curve, cutting interest rates and reducing output. By contrast a monetary expansion would primarily affect the LM curve, also reducing interest rates but also increasing output. They conclude, that the latter case “seems to fit the facts more comfortably. This blog post is simply a few fragmented thoughts on the claims made by Hummel, Henderson, and also Justin Reitz. For simplicity I'll refer to their collective position as HHR. The HHR argument is along the following lines: the Fed only directly controls the monetary base, and it does so to ensure a stable US domestic price level. Since dollars that are held overseas have little impact on the domestic price level we should exclude them. Hummel and Henderson argue that since the ratio of currency to reserves is determined endogenously by the preferences of banks, it is better to focus on the Fed’s control of reserves, and they point out that reserves have approximately been frozen. They do suggest that in theory one should really focus on the domestically held monetary base, and Rietz proceeds along these lines. He argues that since the currency held overseas has no direct impact on the domestic price level this should not count as evidence against a loose Fed policy. Indeed when foreign holdings of currency is stripped out he shows that the monetary base expanded by merely 2% per year. This supports Hummel & Henderson. HHR makes an intriguing claim – not only that the Fed has been pursuing a de facto free banking monetary policy (i.e. keeping the base essentially frozen and then allowing fractional reserve banks to expand and contract the money supply on top of that to respond to changes in the demand to hold money), but that this is the true cause of the Great Moderation. No wonder they are surprised that Selgin doesn’t want to take credit for it! Rather, the bit that Greenspan was directly responsible for resembled a Free Banking environment. But of course the incentive system within the existing regime (e.g. deposit insurance etc) means that the demand for money does not reflect voluntary behavior. HHR would say “but that’s not the Fed’s fault! Blame congress” and I sympathise. But regardless of whose fault it is it is at best an approximate free banking environment, and no one has argued that by resembling a free banking regime on one margin (whilst other margins are non free banking) is an improvement. Again, this comes down to whether you treat the regime as fixed, or expect the central bank to try to use what powers they do have to compensate for problems with the regime. HHR don’t argue that the Fed didn’t play a role in generating the crisis. They merely show that it wasn’t within their narrow remit to prevent it. In isolation, a Fed that tries to limit its sphere of influence and sticks to approximating a free banking policy is a good thing. But in a world were governments create even bigger errors – whether foreign (in terms of their currency manipulation) or domestic (in terms of their addiction to debt financing) – maybe we should hold central bankers to a higher standard. I've just written a short paper talking about why the natural rate is important, and a (very) brief summary of some recent efforts to estimate it. You download it here (data here). The charts are up through 2015, but I thought it would also be interesting to incorporate it in our data section. The chart belows shows the present situation, and as of 2016 Q2 the natural real rate was 1.8%. Using the GDP deflator as an inflation measure, this implies a nominal rate of 2.34%. With market rates (I use SONIA) at 0.47% this implies monetary policy is too loose. Low business confidence: not just because of low demand, but also due to Robert Higg’s concept of “regime uncertainty”. This results from the erosion of investor’s confidence in private property rights, and there is evidence that this occurred in the UK following the crisis. Distressed export markets: since the financial crisis the trade-weighted value of the pound has fallen by about 20%, however 45% of exports go to countries within the Eurozone meaning that the UK is highly dependent on Eurozone growth. Breakdown in financial intermediation: Bank lending has been weak, in large part due to new Basel rules that intend to encourage banks to hold more reserves. Evidence suggests that any gains from quantitative easing were almost totally offset by stricter capital requirements imposed by regulators. In addition the recession directly followed a banking crisis that resulted in the government nationalising the four largest lenders in the country. According to Reinhart and Rogoff, “the aftermath of banking crises is associated with profound declines in output and employment” , and the conventional view is that balance sheet repair takes time. This may especially hold if accompanied by a housing bust – and the UK had one of the largest housing bubbles. Regulatory problems: not only had much of the productive capacity of the economy been hollowed out prior to the financial crisis, there has been little supply side reforms as part of the recovery. The list of regulatory reforms in recent Budgets is underwhelming, treating government investment in infrastructure as being synonymous with supply side growth. Meanwhile airports are constrained by planning laws, housing developers can’t build new housing and small businesses are stifled by red tape. In addition high marginal tax rates across the tax schedule dampens incentives and hinders growth. Monetary policy mistakes: Similar to the US, interest rates in the UK were kept artificially low in the period building up to the financial crisis creating distortions in the economy. This “malinvestment” sowed the seeds of an inevitable correction, but these problems were compounded by additional monetary policy failures. In terms of the crisis period itself, nominal GDP began to collapse in early 2008 and didn’t reach its pre crisis growth rate of around 5% until late 2010. Some argue that the Bank of England was slow to respond to this – interest rates were 5% in February 2008 and they only began cutting in October (to 4.5%). Quantitative easing didn’t begin until 6 months after the collapse of Lehman Brothers, in March 2009. In short, there has been a combination of reasons why the UK economy recovered thw way it did. It was vulnerable to a recession and monetary mismanagement compounded fiscal folly. 2008 wasn’t a temporary, irrational pause in spending but a permanent wealth shock. Some important monetary aggregates have shown growth recently, and MA is no exception. In July 2016 it was growing at 10.28% (compared to the previous year), up from 9.27% in June. The chart below shows the growth rate over the last calendar year. Last month the ONS released the Supply and Use Tables for 2014. You can find them here. They are interesting because they provide a measure of intermediate consumption, which many Austrian economists - who care about the entire "structure of production" - believe is an important missing ingredient of typical national accounts. Indeed it's somewhat odd that Gross Domestic Product strips this economic activity out, making it more of a Net concept. As Sean Corrigan puts it, we want the Hayekian horse (of production) in front of the Keynesian cart (of consumption). Mark Skousen has advocated a measure that he refers to as "Gross Domestic Expenditure", which incorporates all of the production side of the economy. A close substitute for this is "Gross Output", which, as I've previously mentioned, is now published by the BEA (Skousen adjusts Gross Output by adding Gross sales at a retail and wholesale level, to incorporate even more business spending). In 2006 it was growing at 7.88% which indicated an even larger boom that was being shown in NGDP data (which grew by 5.52%). It then contracted by -2.31% in 2009 before picking up again. 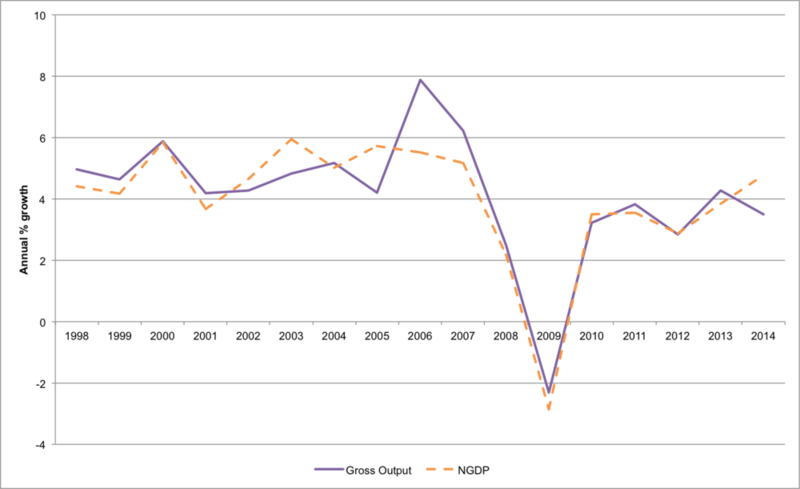 As with NGDP the post crisis growth rate seems enduringly lower. My main interest was the 2014 figure, and we can see that whilst Gross Output grew faster than NGDP in 2013, this was reversed in 2014. Whilst NGDP delivered a robust 4.77%, Gross Output only grew by 3.49%. The problem with offering an alternative to GDP is there's a burden to provide a better one, or a more theoretically robust one. I wouldn't claim that I've achieved that, but I think it's worthy of enquiry. And if the recent debate between Vincent Geloso and Scott Sumner (and Marcus Nunes and Vincent again) is anything to go by, maybe there's increasing interest in getting this right. Our "Austrian" measure of the money supply showed growth of 9.27% in June, relative to last year. This is the highest rate since August 2014, and follows fairly stable growth of6%-8% since 2014. "According to Shackle, the future is unknowable and 'kaleidic' (that is, dominated by patternless changes)"
Selgin's basic point is that praxeology beats kaleidics, and if you have to "temper" kaleidics to retain praxeology, it's no better than mere historicism. Those of us who adhere to Mises' distinction between theory and history; who favour explanation over prediction; and look for pattern changes rather than single point estimates; are thus not truly "kaleidic" economists. OK, fair enough. But there may still be an advantage to getting as close to radical subjectivism as one can get without falling down the black hole of nihilism. The world probably isn't kaleidic, but it may well be more kaleidic than the vast majority of economists are wont to admit. And at important moments it can appear kaleidic. Shackle may be presenting a view - something we can incorporate, without having to fully adopt. After all a kaleidiscope isn't "patternless". It's just highly complex, prone to unanticipated readjustment, and this impossible to forecast. According to Richard Wagner a "kaleidic" view of economists is simply one that takes time seriously, and sees turbulence as the "unavoidable incompleteness of intertemporarl coordinaiton". Yes! The ECB’s big mistake was in responding to these changes in inflation as if they were symptoms of a demand shock when, in fact, they were symptoms of a supply shock. I totally agree that ECB policy decisions played an important causal role in the Eurozone crisis, and I endorse the conclusion that an NGDP level target target would work better. My only gripe is that I believe the lions share of the blame should be placed on the monetary regime that they were following (i.e. inflation targeting), rather than the decisions being made within that regime. In other words I don't think that the ECB are really to blame. It's true that within an inflation targeting regime, policy makers have discretion to "see through" obvious supply shocks. The Bank of England "saw through" a very long period of above target inflation from 2010-2013. But there's two crucial point of difference between the ECB and other central banks, which constrains its actions. One is that it doesn't have the ability to buy sovereign debt from the Eurozone as a whole. The reason for the ECB's slow uptake of QE is primarily due to the political implications of choosing what portfolio of sovereign debt to buy. It's signficantly easier for the US, UK, Japan etc. So to some extent the ECB had its hands tied in terms of the tools at its disposal. But the second crucial point of difference, and more relevant to the 2008 and 2010/11 decisions to raise interest rates, is the fact that the ECB is a new institution with an explicit inflation-only mandate (i.e. its target). In particular, the ECB was tasked with keeping inflation below 2%. For most of its early years, this was reasonably successful. In May 2001 inflation hit 3.1% (and interestingly they decided to see through it, so maybe my point is totally facile), but aside from that single month inflation was under 3% from their creation right up until November 2007. By July 2008 it has reached 4.1%, which is double the upper threshold of its target. So this is the first real test of the strength of independance. A decade of suspicion that the ECB would cave in to political considerations for easy money was now under scrutiny. They cannot refer to unemployment as part of any dual mandate, because they only have a single mandate. Saying that they will see through inflation is akin to saying they don't see it as a problem. I can understand why they raised rates because in a "One Target One Tool" framework that's what you do when inflation is high. Especially when you're trying to create a reputation for being inflation hawks. The US is a great counterexample. Whilst Bernanke cashed in the Fed's credibility by appearing at joint press conferences with Paulson (and doing so much that he could be accused of making matters worse), the ECB did too little. But they didn't have the option of a joint press conference with a Eurozone Minister of Finance, and if they'd ignored their inflation-fighting mandate they'd have jeapordised their raison d'etre. Imagine ECB eased in 2008 & 2011 instead of tightening and did QE earlier. If so, would Brexit be a thing? if ECB totally disregarded its mandate and opted against building credibility would *it* be a thing? I believe that if they had eased it would have cast serious doubt on the ECB's independence. The impact of their decision was terrible, but I understand why they made it. Indeed if the lesson is that they should have exercised more discretion the implication is that we need different people in charge. On the contrary, we need a different regime. The ECB failed because they were set up to fail. P.S. I've been listening recently to David's podcast "Macro Musings" - it is really good. I enjoy Econ Talk but when they're over an hour long I struggle to get through them quickly enough. And because I can't be bothered to spend time identiying the ones I have an interest in I've actually stopped listening. By specialising on monetary economics I know that I will want to listen to each new episode of Macro Musings, and it's quickly become a favourite podcast. It's a brilliant substitute for a faculty lounge for those of us outside academic econ departments, but David ensures that key terms are defined and content is provided so non academics can get a lot out of it. I can't recommend it highly enough. P.P.S. I can't believe my last two posts have been criticising Lars and David, and defending Carney and the ECB. It's been a long academic year and I clearly need some rest! In light of Brexit, Lars Christensen has called on Mark Carney to adopt a 4% NGDP target. In doing so, he has argued that the result of the vote has increased regime uncertainty, which constitutes a negative supply shock. I disagree. Higgs’ description is – believe it or not – fundamentally Keynesian in its character (no offence meant Bob): An increase in regime uncertainty reduces investments and that directly reduces real GDP. This is exactly similar to how the fiscal multiplier works in a traditional Keynesian model. I don't see the problem. For me, an advantage of regime uncertainty is that it puts flesh on the bones of Keynes' "animal spirits". Rather than waving your hands and talking about the confidence fairy, regime uncertainty offers a clear mechanism to show how policy announcements can impact the economy. And that impact is not damaging the potential growth rate per se, but altering the immediate spending decisions of market participants. The two concepts are closely related - regime uncertainty will undoubtedly cause potential growth to fall. But in the first instance regime uncertainty affects aggregate demand. Another way of putting this is that in the equation of exchange, MV=PY, there are two types of aggregate demand shock. Either the money supply can change (i.e. M), or "velocity". Technically, the definition of velocity is anything that affects PY holding M constant. Practically, this means shocks to spending that aren't brought about by changes in the money supply. In other words, they are changes in the demand to hold money. My claim is that we don't need to alter what Higgs means by regime uncertainty to preserve a monetarist framework. First of all, it is clear that Brexit has caused an increase in particular demand for US dollar and other safe assets. This is essentially a precautionary increase in money demand and for a given money base this [is] a passive tightening of monetary conditions. Secondly in my view, more importantly, the increase in regime uncertainty should basically be seen as a drop in the expected trend growth rate in both the UK and the euro zone. This means that we should expect the natural interest rate to drop both in the UK and in the euro zone and maybe even globally. I don't believe there's a need to combine these two valid points. I agree that the surprise referendum result has generated uncertainty about the future institutional structure of the UK. And it is not just economic uncertainty, it is policy uncertainty. In fact, it's not just policy uncertainty, it's bona fide regime uncertainty. Lars' first point is that regime uncertainty, and the typical response to uncertainty - hoarding cash, buying gold - constitute an increase in the demand for money. This means that V has fallen, and this ceteris parabus so has (MV). I agree with this, but view it is a negative AD shock. This regime uncertainty is likely to lead to lower growth prospects, but there are many things that affect future growth other than regime uncertainty. Indeed there's widespread certainty that regardless of the type of deal the UK get, and who the Prime Minister will be to negotiate it, Brexit will be economically damaging. Our future productive capacity has been dented by reduced economic cooperation with the EU. Thus Lars' second point that expected trend growth has collapsed is also true. But I don't see this as part and parcel of regime uncertainty. I see it as a separate shock. The fact that sterling has weakened doesn't demonstrate that regime uncertainty is a negative supply shock, it just suggests that the negative supply shock has thus far dominated the negative demand shock. And I would give credit to Mark Carney for minimising the impact of regime uncertainty - he has calmly and credibly signalled that interest rates are more likely to be cut rather than increased. He hasn't said "a negative supply shock will put upward pressure on inflation and we will carefully monitor inflation expectations to ensure they remain anchored". Rather, he's said "we won't let AD contract". Perhaps he is a closet NGDP targeter after all! Whilst I'd like to see the Bank of England adopt an NGDP target, unfortunately I don't see the present environment as being especially fertile. And crucially the reason is that inflation is currently well below target. If inflation was on target then whether Brexit constitutes a supply shock or a demand shock would matter because an NGDP target would imply a different policy response to an inflation target. For example, if inflation were currently 2% then a negative supply shock would cause an inflation targeting central banker to tighten policy.But an NGDP targeter would see no reason to change the policy stance. Thus a closet NGDP targeter might be tempted to jump ship. But inflation is 0.3%, and the Bank of England have plenty of room to permit supply shocks to manifest themselves without tightening. The regime doesn't really matter right now. Finally, Lars says "In a Market Monetarist set-up this [a Keynesian view of regime uncertainty] will only have impact if the monetary authorities allowed it" which is true. Fortunately, however, Carney seems willing to offset regime uncertainty. When the result of the UK referendum on exiting the EU (Brexit) was announced, the FTSE 100 immediately fell by 8.7% and sterling fell around 8% relative to the dollar, and down 5% against the Euro. Clearly, markets were surprised. But why? Even though opinion polls and betting markets indicated that "Remain" would win, it was hardly like Leicester winning the Premier League. I think the problem comes down to mindset. The debate between opinion polls and prediction markets is essentially a debate about forecast techniques. Although useful, they drive attention to narrow outcomes. Billions of pounds were clearly hinging on a a few percentage points spread. This implies that in future we need better quality opinion polls and better functioning prediction markets, and lots of money can be made from better probability values. However I'm pleased that the failure of forecasting has generated increased attention and utilisation of the scenario method. A scenario planner doesn't care what the probability of Brexit is. We simply didn't know. What we did know, was that one of two possible outcomes could happen - a Leave vote, or Remain. Therefore plans should be made around both. As an economist, I was routinely asked in the buld up to the vote "do you think we'll leave?" This is based on a forecasting mindset. I tried to say "I don't know", but it's hard not to weigh in with a (flawed) prediction. The better question would be "what should we do if we leave, and what should we do if we remain?" Now that the result is in, the uncertainty is not over. The manner in which Brexit will occur, if at all, is the topic for discussion. And thus far no one has asked me "what do you think the most likely arrangement will be?" At heightened uncertainty, you only really have scenarios. Hence newspapers are discussing "The Norway option" or "Article 50 isn't triggered" or "Scotland has another referendum". Scenarios are the go to framework. I don't meen to disaparage polls or markets. Both tell us different things, and are useful. But it's clear that too much money was riding on their predictive power, and we should be humbled by that. I am encouraged that people are thinking in terms of scenarios, and hope the economics professsion does the same. I gave a talk last night on the role of economist as public policy advisor. In particular, I was interested in challenging the prevelent conspiracy theory that economic crises lead to neoliberal policies, which lead to bad outcomes. To the extent that ‘neoliberalism’ has come to dominate western policy making, it isn’t liberal. To the extent that ‘neoliberalism’ is extreme free market dogma, it’s of negligible impact. The second area of ignorance is Public Choice theory. I argued that treating neoliberalism as being synonymous with corporatism simply ignores what "neoliberals" actually believe - we don't think that unemployment is due to individual weakness, but to instutitional barriers such as labour markets rigidities and occupational licensing. In other words "we" have a very clear theory of regulatory capture and crony capitalism. This produces a 2x2 matrix where we can not only assign countries to various quadrants, but also map how they move between quadrants over time. I used this as a basis for "The Economic Freedom Parlour game" and it seemed to go down well. According to Hayek and Friedman, you can’t have political freedom without economic freedom, which implies that quadrant B is unstable. According to Lawson & Clark's data, less than 10% of the data set is contained in quadrant B. In 1980, for example, there were 12 cases, and typically these were "high income Western nations who were in the final stages of their most socialist periods”. The fact that 11 of them (with the exception of Venezuela) subsequently becamer more economically free (B->A) seems to support their thesis. We can also bring in the Road to Serfdom, where Hayek claims that when democratic socialism fails planners will move toward totalitarianism (i.e. B ->D). If we consider this to be a prediction (i.e. that it will necessarily happen) it looks to have been refuted. 11 of the 12 avoided that path. But if we consider it to be a warning, the sole example of Venezuela is validation. In other words, those European countries didn’t let the planners continue their planning, and neoliberalism saved the day. Venezuela really began to lose economic freedom from 1990-1995 and since then political freedom has fallen (and is falling). For me, Eastern Europe is an example of the success of neoliberalism. However the success could have been greater still. The left falsely identify Friedman (rather than Hayek) as leader of the neoliberal revolution because they can pin more on him. But it’s Friedman’s neoclassicism (i.e. method) that dominated the economic and public policy debate, not his neoliberalism (ideology). We need more of it. In 1979 Jeff Hummel published an important critique of Austrian business cycle theory. I'm biased, but I felt it's received insufficient attention amongst Austrians. Especially in terms of the unsustainability of the boom - how inevitable is the upper turning point? I think that many Austrians take it as a given that at some point an increase in the money supply will begin to accelerate, couched under the claim that "X is necessary for the boom to continue". But what about if you don't want a boom to continue? What if, after a boom, you just want a soft landing? Can you avoid a recession? At this point my inner Austrian resorts to hand waiving and saying things like "structure of production" and "relative price effects". But I also find it interesting how many explanations revert to political economy claims. In 2013 I wrote up a working paper and have decided to release it now as a special report. Must an increase in the money supply lead to an increase in the growth rate of the money supply? According to Hayek (1934) this would be necessary to sustain the boom, and this is true. But what if you don’t want to sustain the boom? What if you want the structure of production to be maintained at its existing level? I point to "capital heterogeneity" effects and the Ricardo effect as distinctly Austrian explanations. However the literature review is incomplete and there are some serious flaws and problems. The main reason for not taking it any further is that back in 2013 I became aware of a working paper by Larry White and George Selgin, on the same topic. Their stylised paths of money paths of the money stock, nominal interest rate, and real interest, approximated what I felt had been missing in the Austrian literature. And, interestingly, they suggest that a slowdown in the growth of money supply is not a necessary turning point. In fact, they criticise Hayek (and others) for the same reasons Hummel does, as far as I can tell. Their article is called "The Austrian Theory of the Business Cycle in a Fiat Money Regime" and I look forward to reading it in print. I spent this morning populating the monetary dashboard, and thought I'd write up why my current view of the UK economy is "meh". Monetary growth is reasonably strong and consistent. M3 has fallen from 2.7% to 2.3% and M4ex has fallen from 4.8% to 4.2% but narrower measures have grown - MAex is 7.8% (from 7.3%) and household Divisia 8.9% (up from 7.4%). Inflation measures remain subdued - CPI has fallen from 0.5% to 0.3%, RPI is down from 1.6% to 1.3%, input prices are -0.7% and output prices -6.5%. From a monetarist perspective there's no sign of impending return to the inflation target - indeed inflation expectations over the coming year have fallen from 2% to 1.8% and the Fed 5 yr be rate is 1.45%. We are still a long way from "normal" inflation. The unemployment rate is 5.1% and the ratio between vacancies and unemployment for Jan-Mar at 0.45. Average Weekly Earnings have risen slightly, but are under 2%. The HM Treasury survey of forecasts shows that growth of 2.1% is expected next year, and inflation of 1.9%. Interest rates have fallen slightly, sterling is down, yields are down. With so much uncertainty due to the possibility of Brexit it would be wise to be cautious. And with inflation so low, policymakers hands are pretty tied. 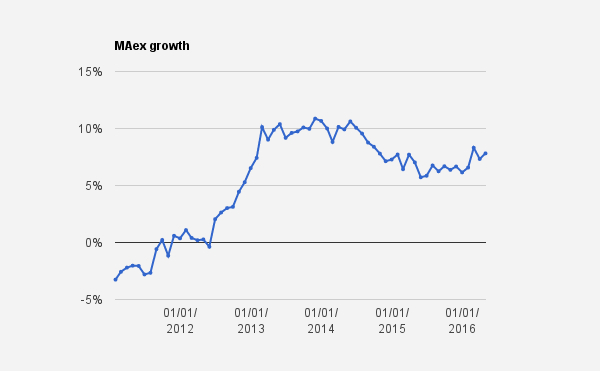 A recent update to MAex has revealed that narrow money growth is a robust 7.81%, up slightly from 7.33% in March. It's been in the 6%-9% range for over a year. Focusing entirely on the economics, we consider that it would be a major mistake for the UK to leave the European Union.Leaving would entail significant long-term costs. The size of these costs would depend on the amount of control the UK chooses to exercise over such matters as free movement of labour, and the associated penalty it would pay in terms of access to the single market. The numbers calculated by the LSE’s Centre for Economic Performance, the OECD and the Treasury describe a plausible range for the scale of these costs. Although I don't feel sufficiently familiar with the studies mentioned to add my own name, I respect and admire those who have done so. This is a serious and authoritative statement that is helpful to voters who want to understand the economic arguments (although I'm not sure we can ever focus "only" on the economics without having a very narrow, technical and unhelpful definition of what constitutes economics). Recently The Telegraph published an article by Tony Yates, one of the organisers of the letter. Unfortunately, I think the article gives a misleading account of the scale of consensus amongst the economics profession. Compare the Great Depression to the financial crisis. In the US, output fell by 30pc to its trough. Following 2008, it fell by 4pc. A lot of factors are at work here. But part of it was about lessons we have learnt in macroeconomics. For example, we understand better why a fiscal stimulus works and when it’s beneficial. The support for this in the economics community helped bring about the US fiscal stimulus package of 2009. It isn't clear to me whether Tony is saying that (i) there are some topics where economists have a consensus, and can therefore give good policy advice (and fiscal stimulus and the economics of Brexit are two of those areas); or (ii) disagreements between the cosigners on fiscal stimulus is all the more reason to take seriously their agreement on Brexit. Who were the cosigners who believed that the US fiscal stimulus backfired? Which ones thought UK austerity was a myth and cuts should have been deeper? Also, if he wanted to pick a topic on which there was genuinely a consensus among the profession then why didn't he choose free trade? Indeed that would be much more relevent in the context of a vote to leave a free trade area. The headline reads as if Tony is referring to all economists. In fact, he's claiming that he's only referring to a group of 280. I've written plenty of op eds and am used to editors using a slightly misleading headline in order to generate a response. But usually I'd say "I didn't write the headline!" I don't think Tony wrote the headline, but I'm surprised that he's not willing to distance himself from it. If 280 economists agree on something policy relevent then it is worth reporting. But if it's reported in a way that implies consensus within the entire profession, this actually reduces the quality of public debate. There's even an appendix where I outline my own personal forecasts. Download the report here. 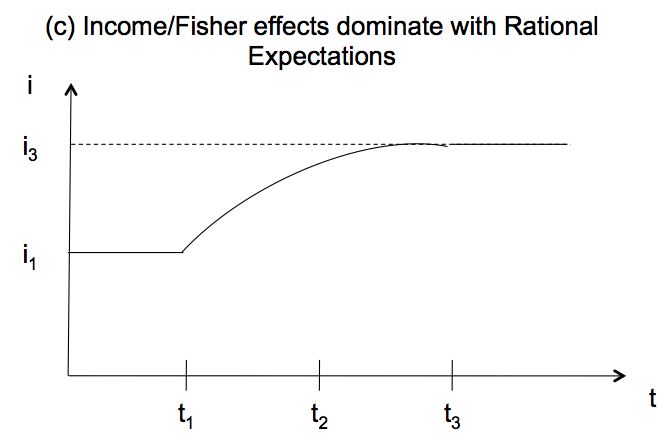 I am a big fan of Tyler Cowen and Alex Tabarrok's "Dynamic AD-AS model". I introduce it to around 400 people a year. If you're not familiar with it, I advise you to read their excellent principles textbook. I also have a youtube video, and a presentation. Lars Christensen (2013) has utilised the dynamic AD-AS model to provide an explanation of the Turkish demonstrations. My quibbles with his account would be (1) he argues that demonstrations will cause temporary disruption to production, and models this as a negative shock to SRAS. I would claim this is a negative shock to the Solow curve. (2) He argues that regime uncertainty will damage the potential growth rate of the economy, and models this as a negative Solow shock. I would argue that this is a secondary shock, and that the primary effect of regime uncertainty would be a negative AD shock. In this post I just want to present a very simple “policymaker” view of the great recession. This involves a comparison of two time periods: Q1 of 2008 and Q2 of 2009. In 2008 AD is growing at 5.5%, which is split between 3% inflation and 2.4% real GDP growth. We can assume that in early 2008 the economy is healthy, and on the Solow curve. Then, by the second quarter of 2009 a series of problems have affected the economy. These include the collapse of the US subprime industry, massive declines in global confidence, and negative wealth effects. Students are asked to summarise these events, and should identify them as negative AD shocks (in other words NGDP was allowed to contract). This implies that inflation and real GDP should fall, and this can be corroborated with the actual data. Figure 1 shows the “solution”. This can generate a discussion about appropriate policy responses, and students will probably mention monetary easing or fiscal stimulus as means to boost AD. Indeed in 2011 Q1 inflation was back at 3%, real GDP growth was 2.1%, and so the economy was close to returning to the original position and avoided the “laissez-faire” outcome of substantial deflation and a SRAS that shifts downwards. Policymakers might indeed argue that successful (albeit belated) injections of demand worked. We need to start the analysis before the crisis, in case it was indeed an unsustainable boom. But we also need to allow for the possibility that central bank ineptness makes things even worse. I've done just that in a longer article, published by the Journal of Private Enterprise. Absent further shocks if AD remained at -3.9% then once inflation expectations fully adjust the implied rate of inflation would be -6.3% (i.e. this is where the AD curve intersects the Solow curve). This implies something has also affected the Solow curve, and so we need to use the dynamic AD-AS model to unpick this.